Lankelma’s ultraviolet (UV) video cone is a means of Fuel Fluorescence Detection. The in-house development features UV-emitting LEDs that can detect cold light emission luminescence from fuels and oils, providing a more accurate picture of the ground in real-time. Many industrial oils and fuels visibly emit fluorescence when excited under low wavelength UV . The florescence will vary in colour from violet to yellow depending on the type of hydrocarbon. 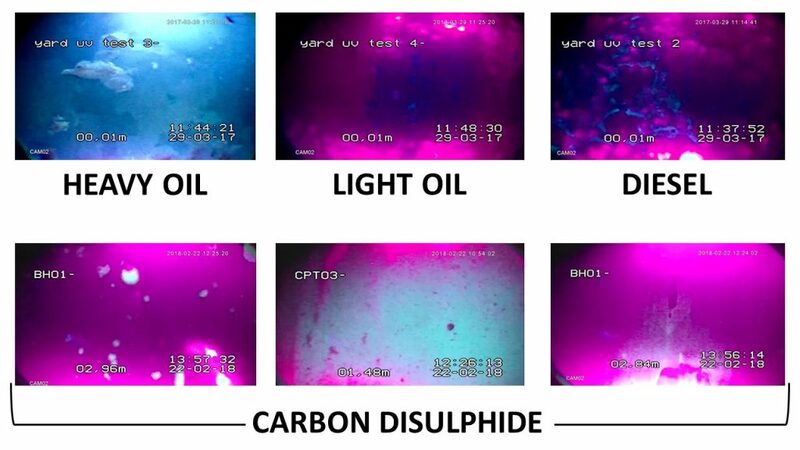 The UV video cone can detect these emissions at low concentrations, with images streamed lived to a monitor in the CPT rig. Results can be used to enable real-time ground characterisation and to help target additional sampling and testing. Pushed into the ground at 0.5 cm/s using CPT equipment, the video cone has a camera and UV LEDs sitting behind a glass window. Alongside fuel and oil contamination, the cone allows particles such as shells and sand grains to be distinguished easily; small voids and gas bubbles are also visible.